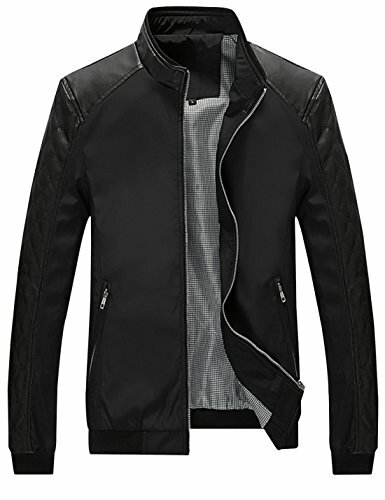 NOTE: 1.This jacket zip on the left. 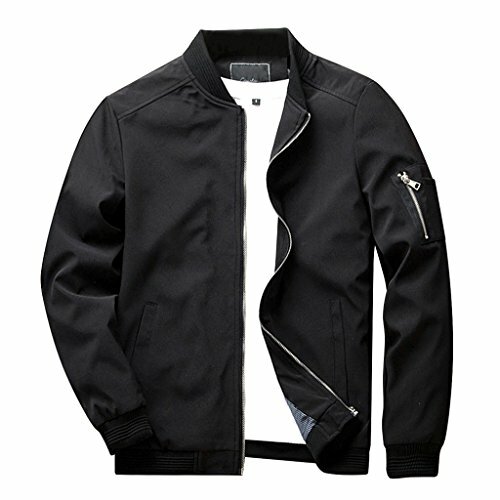 2.This item is SOLD BY OUR SHOP, other seller sold it cannot guarantee the quality and shipping. Please DO choose "JINFENG" IN STORE. 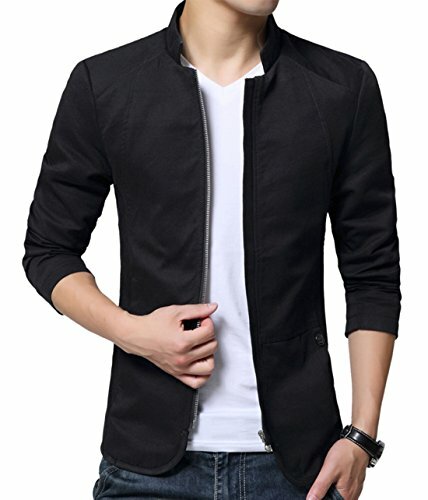 CRYSULLY Men's Spring Fall Casual Cotton Slim Fit Thin Lightweight Outwear Sportswear Bomber Jacket Coat: 1.Material: Cotton + Polyester 2.Style: Casual 3.Fit Type: Slim fit 4.Thickness Level: Thin 5.Elastic Level: Micro elastic 6.Color: Blue, Red, Black 7.Suit Occasion: Good choice for many occasions, casual, party, outdoor activities or relaxing weekends. 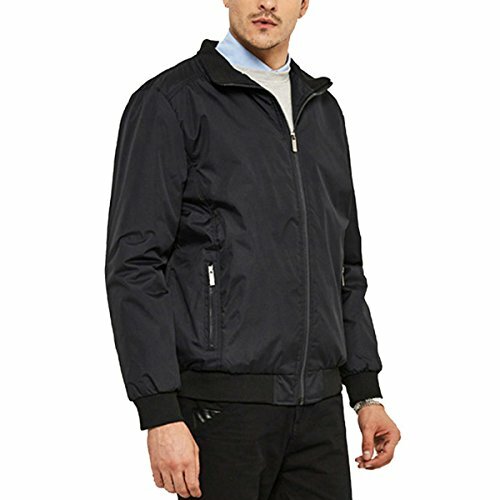 Garment Measurements: US XS (China XL): Chest-42.5"; Shoulder-18.0"; Sleeve-25.2"; Length-26.8"; US S (China 2XL):Chest-44.1"; Shoulder-18.4"; Sleeve-25.8"; Length-27.6"; US M (China 3XL):Chest-45.7"; Shoulder-18.9"; Sleeve-26.4"; Length-28.3"; US L (China 4XL):Chest-47.2"; Shoulder-19.4"; Sleeve-27.0"; Length-29.1"; Attention: All the size data are about garment measurements, NOT body measurements. Please choose the one a bit larger than your own chest measurement when you refer to size chart. 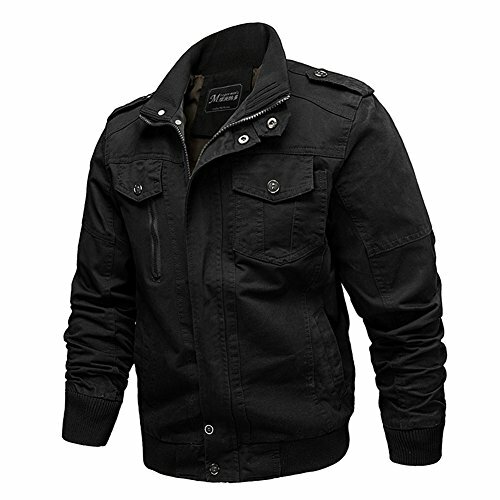 Men's seasons casual Slim Fit Cargo Stand Collar Military Thicken Cotton Fleece Jackets Coat！ Material: Cotton Style: Casual Fit Type: Slim Thickness Level: Basic thickness Elastic Level: Normal Color: Army Green, Khaki, Black Size:US standard--S,M,L,XL,2XL,3XL(the size details reference picture) Suit Occasion: Good choice for many occasions, casual, party, outdoor activities or relaxing weekends. 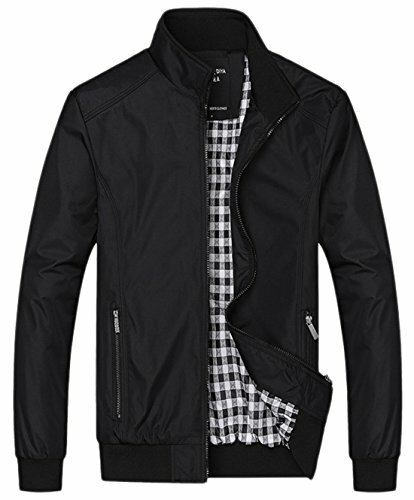 Match:The jackets can adapt to many styles of pants, you can try, and there will be different surprises. ★Note:Since our clothing label is Asian size, please select US size according to size selection. 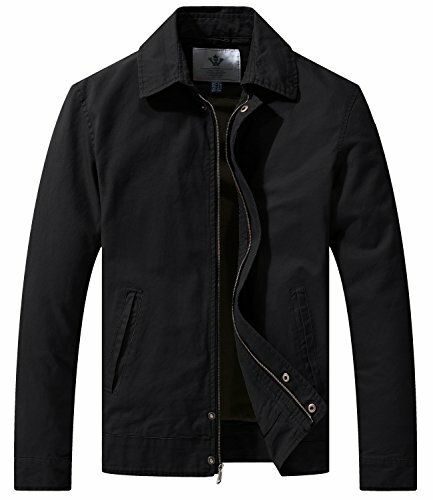 ✔Why choose Helisopus Men's casual solid jactets? •Helisopus is a registered trademark in the United States. We are committed to provide our customers with high-quality products and quality after-sales service. If you are not satisfied with our products and services, we will provide you with a satisfactory solution after contacting us. 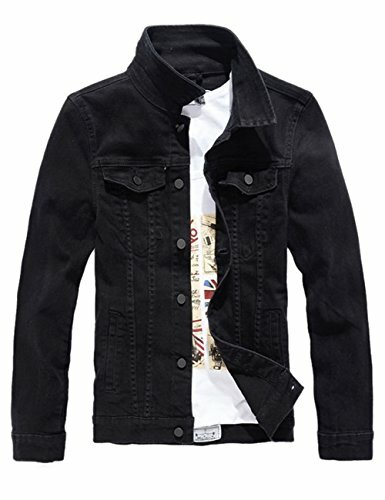 Our product size is US size, please measure your body and choose the size base on the size information here.US XS: Length:26.57" Bust:45.67" Shoulder:18.50" Sleeve:24.80"US S: Length:27.56" Bust:47.24" Shoulder:19.88" Sleeve:25.20"US M: Length:28.35" Bust:48.82" Shoulder:20.08"Sleeve:25.98"US L: Length:28.94" Bust:49.21" Shoulder:20.08" Sleeve:26.38"Not chlorine washNon-reversible dry cleaninglow ironHand wash below 30 degrees temperaturePls allow 2-3cm error because of manual measurement.For the color,there maybe some difference from the picture because of the light and screen. 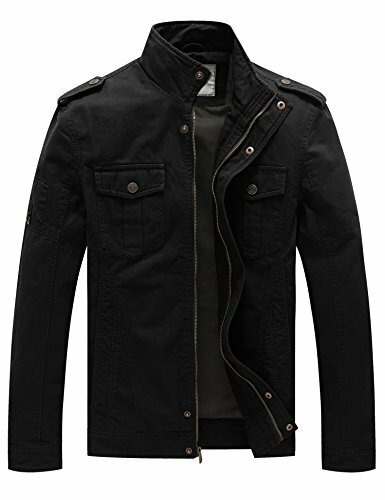 mens cotton jacket|| Top 7 best stylish casual lightweight cotton jacket for men. 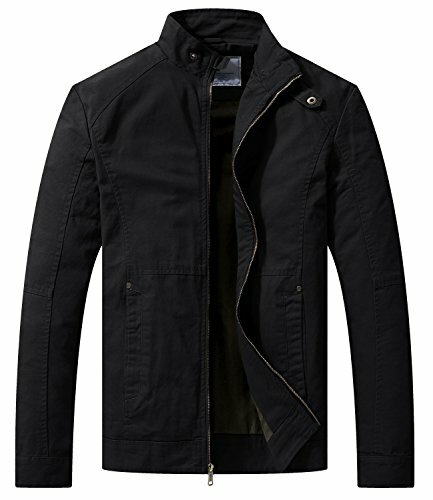 Compare prices on Black Casual Mens Jacket at ShopPlanetUp.com – use promo codes and coupons for best offers and deals. We work hard to get you amazing deals and collect all available offers online and represent it in one place for the customers. Now our visitors can leverage benefits of big brands and heavy discounts available for that day and for famous brands.